Remember the gleaming porcelain bowl installed in your bathroom all those years ago? You can get it back! Here's how. A dreaded household chore, cleaning the toilet is the definition of dirty work. Mostly it’s a matter of hygiene, but cleaning the toilet properly can also make the fixture last longer, particularly if you live in an area with hard water. While the self-cleaning toilets of tomorrow hold out the promise that one day, we’ll be free of this least-favorite duty, it is—at least for the time being—unavoidable. The silver lining? It’s actually not at all hard to clean a toilet. Here’s how to do a thorough job. Before getting started, suit up in protective gear. Rubber gloves are must, but an apron and protective eyewear might be a good idea, too, since the process involves some harsh chemicals. An ounce of prevention is worth a pound of cure, as the saying goes. The next preparatory step is to drain the toilet. To do so, you can turn off the water supply and then flush, or you can wedge the float valve (also known as the ballcock) so that after flushing, the toilet does not automatically refill. 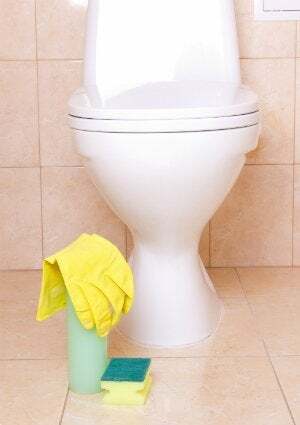 Lift up the toilet seat and squirt disinfectant around the rim and sides of the bowl, allowing it to run slowly down to the bottom. (If you live in an area with hard water, opt for a disinfectant that contains a chemical like borax, one that removes lime scale. Alternatively, you can purchase and use lime scale remover separately.) With a stiff, plastic-bristled brush, scrub the cleaner over the entire bowl, then allow it to set. To remove tough stains, use a wet pumice stone to scrub the affected area of the ceramic bowl. Pumice stone can also dislodge lime scale deposits. It’s a handy tool, no matter the specific cause of discoloration. With the disinfectant working its magic, close the seat and lid and focus on the exterior. Here, use an antibacterial spray, following with a clean rag or paper towels to wipe it all down. Pay extra attention to the seat hinge, notorious for its grime buildup. Finally, spray and wipe both sides of the lid and seat. Now grab your scrubbing brush once more and have another go at the toilet bowl. This time, spend most of your energy on the area underneath the rim and down into the toilet U-bend. Once finished, restore the water supply or unplug the float valve. Flush the toilet, allowing fresh water to clean off any remaining disinfectant. Last but not least, rinse off the bristle brush so that it be used again—next week!